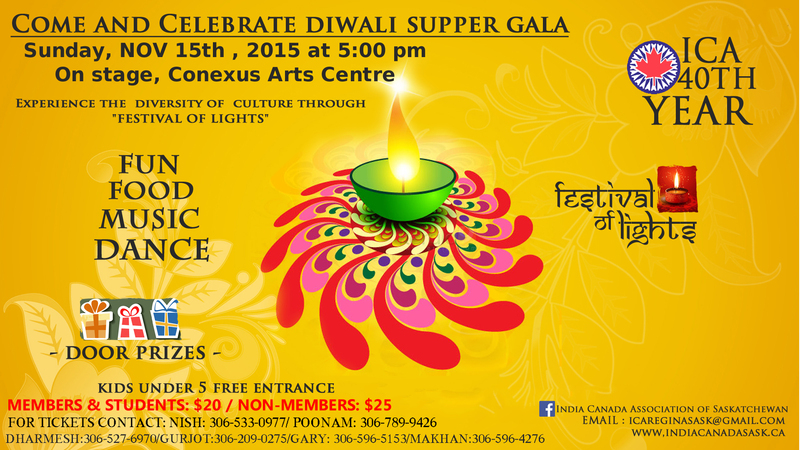 India Canada Association (ICA) is delighted to announce that a Diwali Supper Gala is being hosted on Sunday, November 15th at Conexus Arts Centre on the main stage at 5:00 PM. It will be an evening filled with fun, entertainment, music, dance and fireworks, not to mention the delicious food. ICA encourages all the members and non members to come and celebrate the festival of lights. Its a fabulous opportunity to show your friends and colleagues the richness of Indian Culture and a taste of India. Tickets are $20 for ICA members/students and $25 for non-members, kids under 5 free entrance and supper. For tickets, please contact Nish Prasad @ 306-533-0977, Poonam Sood @ 306-789-9426, Dharmesh Gandhi @ 306-527-6970, Gurjot Sandhu @306-209-0275, Gary Grewal @ 306-596-5153 or Makhan Sharma @ 306-596-4276. You don't want to miss this opportunity!!!!!!! !